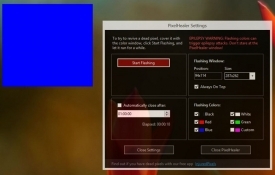 "Fix the dead pixels on your screen with PixelHealer." We’ve all been in the situation where we purchase a brand new computer from an online retailer for hundreds and sometimes even thousands of dollars, wait for it to arrive, open it up, turn it on, and BOOM… a dead pixel. Depending on where the dead pixel is located, many PC users will leave it alone and act as if it isn’t there, while the minority of us will actually go through the process of returning the PC and requesting a new one that is dead pixel free. Most people, however don’t even notice dead pixels on their computer. Yes, that’s “pixels” with an “s” for plural. There are thousands of people that buy PCs everyday with dead pixels and they go completely unnoticed. That is at least until the warranty is up, but at that point it is well too late to attempt a return of the item. Many of these dead pixels go unnoticed because most people do not know how to properly test for dead pixels. If you follow the new programs section here on Rocky Bytes, you will notice an application that was recently posted called InjuredPixels. InjuredPixels is a great application to have in your testing arsenal before and after you purchase a PC. Its companion application, PixelHealer is great for when you find dead pixels. InjuredPixels can be used as a great decision making tool. If you run it on a computer before you purchase it, InjuredPixels can help you decide whether or not you’re going to buy the PC. If you do not find any dead pixels and run the program again at home only to find one lowly dead pixel, InjuredPixels can help you decide whether or not you’re going to return it to the retailer. But what if you just spent a lot of money on the computer and a lot of time waiting for the PC to arrive at your door. Or maybe you purchased the PC for a big project and you do not have time to return the laptop? Or maybe you’re just one of those avid DIY (do it yourself) type. Whatever the situation, you have options. 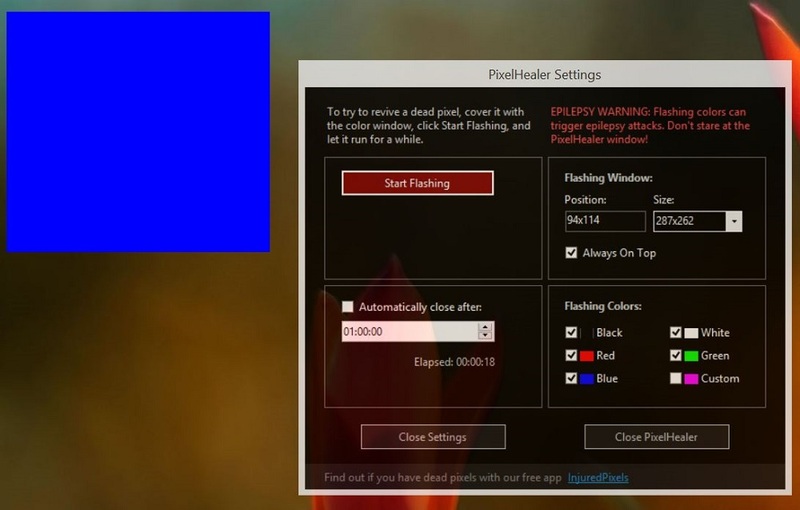 PixelHealer, as its name suggests is an application that attempts to fix the dead pixels in your screen by flashing colors over top of each dead pixel in order to “revive” them. Sometimes it’s successful, sometimes it’s no use, but if you’re in a dire situation, it is better to try then not. HEALTH WARNING: Do not stare at the flashing colors during the test as this can cause epilepsy attacks to surface.